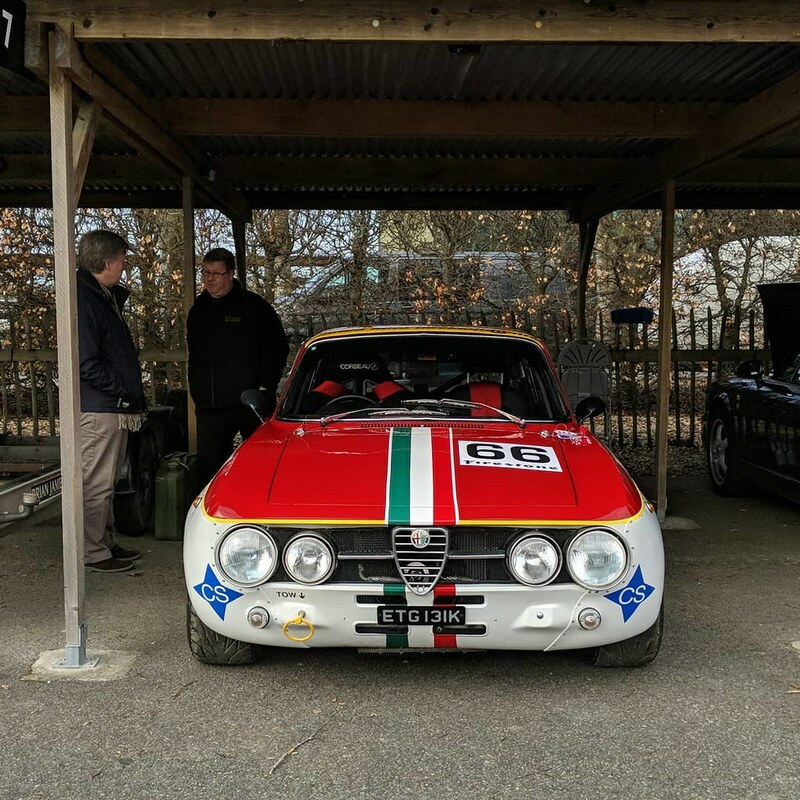 Over a number of years there have been various attempts to run races for Classic Alfas, in the UK, but somehow it has never been able to sustain a series or championship for these iconic Italian cars. However, Julius Thurgood (Historic Racing Drivers Club) was confident enough to plan a pilot race last October at Donington and this would prove the starting point for further races in 2019 and beyond. So successful was Julius’s pre event publicity for Donington that it produced an entry of no fewer than 29 cars. 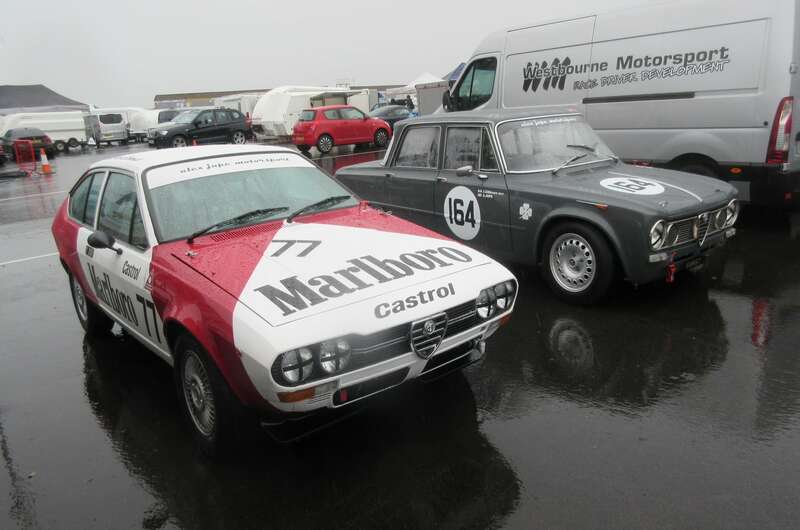 The downside was that race day proved to be one of the wettest meetings of the year, with most races being cut in length – the Alfa race from the originally scheduled from 30 to 15 minutes. This didn’t deter most competitors and the race turned into a fine battle between the Alfetta GTV of Chris Snowdon and the surprisingly quick Trofeo Alfasud Ti of Ted Pearson, Chris eventually taking a fine victory. Richard Drake’s Alfasud had run third until the final lap when a spin at the Old Hairpin gave away the place to the GTA Junior of Ambrogio Perfetti. Julius has been able to book three dates for 2019 – Silverstone, with the VSCC, on April 14th,Thruxton (June 2nd) and Castle Combe (October 6th) – and for the first meeting at Silverstone has gathered another excellent 26 car entry. Of the top four finishers at Donington, only Ted Pearson is not entered this time, having decided to concentrate on his Historic Formula Ford programme. Chris Snowdon will be driving the same Alfetta GTV as last year. This is a well known car which was built up by Leo Bertorelli and Peter Hilliard to compete in the 1980 Tourist Trophy. Unfortunately problems in qualifying meant that it did not start. Thereafter it was raced by Peter and Vic Woods before being bought by Richard Melvin who has entered it again for Chris to drive at Silverstone. It must be one of the favourites for another win. Intriguing though will be who will be his main opposition. Richard Drake’s Napolina liveried Sud will undoubtedly be quick as will the GTAm replica of John Symes prepared by Bianco Auto Developments. John has had many successes in past Classic Alfa races, including a fine win at Donington as far back as 1992 but has lost none of eagerness to be near the front. We know Ambrogio Perfetti is quick in the rain but will his 2000GTV be as competitive on a dry track? He could be the dark horse here as will Richard Merrell who was a front runner last October, finishing 4th, just behind Richard Drake. Let’s hope he has more in-car video that has gave us some exciting footage in the past. Amongst the cars from the 1960s in the Monza class, we shall look to the Giulia Sprint GT of David Alexander and the 1600 GTA of Neil Merry, both regular competitors in other series while it will be good to see a couple of the Giulia Ti Supers in action in the hands of Frank Slevin and Ben Cater. A car that we are always happy to see is the Giulietta Ti of Gavin Watson. In original form, this car was fitted with a 1300 engine but it has been upgraded to a 1600 unit and anyone who has stood at the end of a long straight such as the run to the Esses at Snetterton will have relished the wonderful sound it makes. Some of the closest competition at Silverstone will probably come in the Nord class where we find, in addition to Ambrogio Perfetti, several cars that could feature near the front including five Alfetta GTVs. There should have been six but Micky Bolton has withdrawn his entry after a last minute request to make trophies for all the day’s HRDC races (as he has done for many years but hoped to avoid this year!). The remaining Alfettas include those of Alex Jupe and Henry Chase. Alex’s car finished 6th in the Donington race and is easily recognisable in its Marlboro livery. 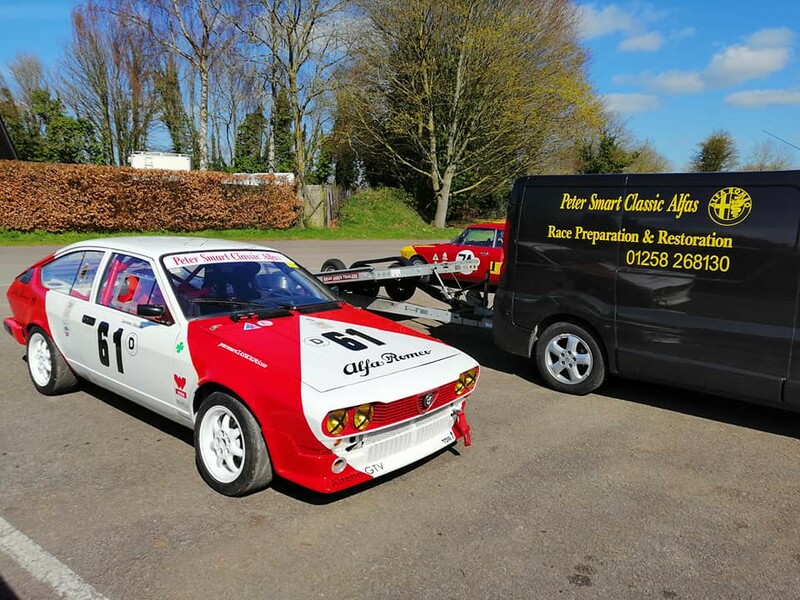 Henry’s black Alfetta is equally familiar with its Napolina logos and is usually driven by his father Stephen who has been an enthusiastic Alfa competitor for many years. Another red and white Alfetta (non Marlboro!) is that of Lawrence Alexander which is prepared by Ian Brookfield at Peter Smart Classic Alfas. Louis Frankel is racing the ex Julius Thurgood 116 series Giulietta while the youngest car in the race is a 75 Twin Spark in the hands of James Wright. We hope the race will keep everyone entertained for (we hope) the full 30 minutes with qualifying due to start due at 10.20 and the race at 2.45. Betting on who will come out on top in such a varied field is always hazardous but serial Alfa race winner Chris Snowdon must be one of the favourites with Richard Drake again in contention with a horde of Giulias and Alfetta jostling not far behind although Chris will be watching Ambrogio Perfetti who may be chasing him hard.